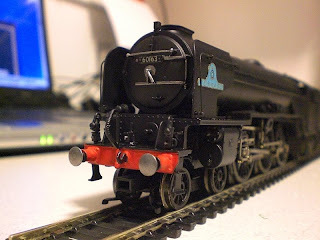 THE BRITISH RAILWAY STORIES LTD: "60163, Tornado..."
Seen above is my completed model of 60163, Tornado, depicted as she will look in 2011. 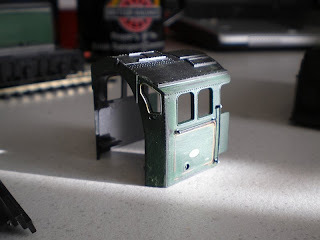 The cabside had its rivets removed and paint stripped. 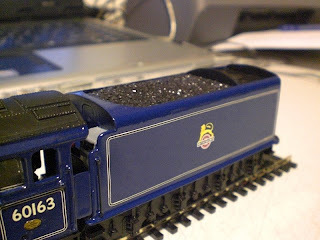 To me, Bachmann's backhead is excellent for detail, but it only really comes out when painted - here, I have handpainted the backhead myself. 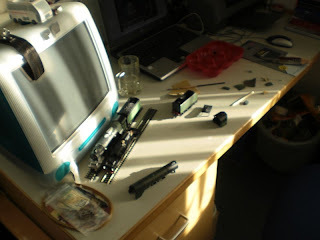 Some further modifications will be made to the cab in the shape of cabinets under the driver's seat. 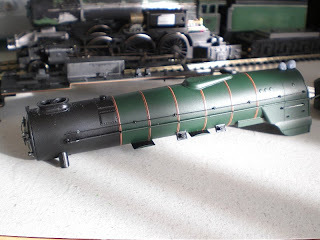 The tender tank needing rebuilding to better represent 60163's larger tender tank, and if you look carefully on the finished pictures, you'll see I modelled the cabinet of dials on the right hand side of the tender footplate as well! 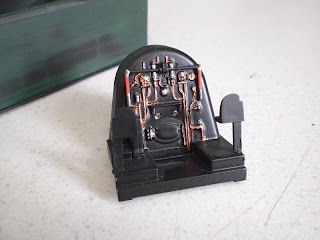 The boiler had minor alterations - chimney shortened, dome lengthened - this is hardly noticeable on the model, but it's there! 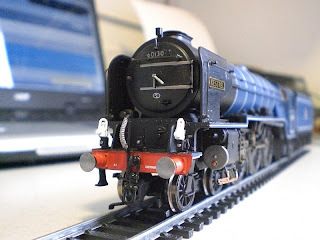 Tornado's safety valves, cab roof, dome and chimney were reprofiled to meet Network Rail's 13ft above rail height stipulation, and so has my model. 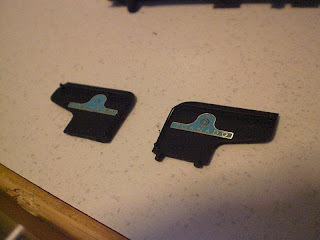 The model was then sprayed black using Gamesmaster's "Chaos Black" - I swear by this stuff, never had a problem with it. 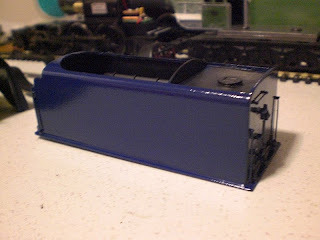 It forms a perfect undercoat for certain shades of blue (especially my specially mixed Express Passenger blue paint! ), and dries evenly. Be careful, however! 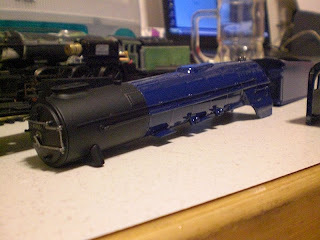 This was my first attempt with a spray gun, and in retrospect while the coat is even, it is also too thick. I'll be more careful next time! 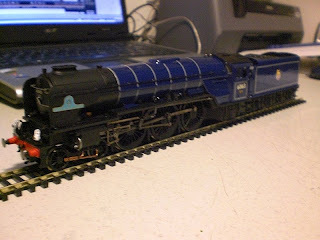 Next came the adding of transfers...it always helps to have another model around to check where the lining goes - you'll notice in the later photographs that my model is missing the lining on the footplate - there is a good reason for this. I forgot! The transfers are Fox Transfers - use lots of water, soak up the excess with a cloth or tissue, and use a cocktail stick to position it carefully! 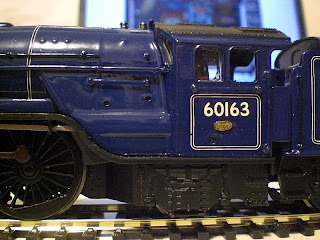 There's more to do which shall be covered in a future post - adding the roller bearing axleboxes on the tender and cartazzi truck is the major one, and another aesthetic piece is the adding of spoked wheels on the tender (as on the real Tornado). 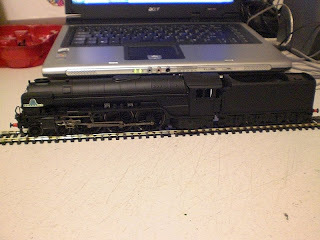 I'll also cover how I added the A4 chime whistle to the right hand deflector. 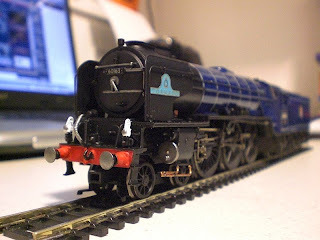 I stumbled on your blog while trying to find a suitable BR Express Blue paint for my Tornado (a K30 from DJH in white metal) which will be finished in the coming winter. 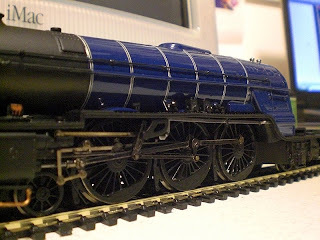 Thanks for the supplier info, but I would like to ask what modification to the Blue did you do from the standard colour (P132 from Phoenix I guess)? No actually - it's an acrylic made up from various gamesworkshops shades. 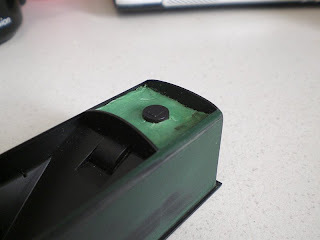 The sheen comes from the enamel varnish I was using on top.